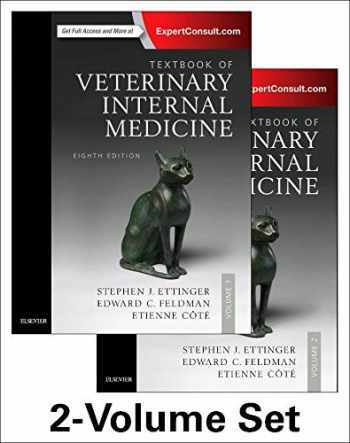 Acknowledged author Stephen J. Ettinger DVM DACVIM wrote Textbook of Veterinary Internal Medicine Expert Consult, 8e comprising 2736 pages back in 2016. Textbook and etextbook are published under ISBN 032331211X and 9780323312110. Since then Textbook of Veterinary Internal Medicine Expert Consult, 8e textbook received total rating of 4 stars and was available to sell back to BooksRun online for the top buyback price of $110.96 or rent at the marketplace. Your days spent fruitlessly scouring textbooks and websites for credible vet information are over! Now you can get the whole story ― the accurate story ― all in one place. Introducing The Textbook of Veterinary Internal Medicine, Expert Consult, 8th Edition. Still the only comprehensive resource for veterinary internal medical problems, this faculty-and-student-favorite offers unparalleled coverage of pathophysiology, diagnosis, and disease treatments for dogs and cats. In addition to new chapters and discussions on the industry’s most topical issues, this "gold standard in vet medicine" comes with hundreds of original videos, algorithms, and learning tools to really bring all the information to life. There’s no better source to help you unlock the secrets of veterinary medicine than Ettinger’s! Fully searchable online text offers quick access to the most trusted information in the field.Complete library of over 500 original clinical videos you can believe in. Instead of fruitless YouTube searches, each video expertly breaks down veterinary procedures and important signs of diseases and disorders that are difficult or impossible to understand from written descriptions alone.In-depth coverage of timely issues includes expert explanations on topics such as the genome, clinical genomics, euthanasia, innocent heart murmurs, hyperbaric medicine, home prepared and raw diets, obesity, botulism, artificial pacing of the heart, and cancer vaccines.Thousands of references accessible from the printed book with the click of a QR code.256 all-new client information sheets can be downloaded, customized, and printed as client handouts.214 new and updated clinical algorithms aid in disease identification and decision-making. Exclusive access to Expert Consult Online website offers the complete library of original video clips, heart sounds, the full collection of client information sheets, and hyperlinking of references to their source abstracts in PubMed.NEW! In-depth coverage of the latest information and trends in small animal internal medicine. Completely new section on minimally-invasive interventional procedures includes techniques for treating respiratory, cardiovascular, gastrointestinal, urologic/nephrologic, and neoplastic disorders.17 new chapters address the major clinicopathologic abnormalities that occur in canine and feline laboratory testing.Completely new section on management of mutually-antagonistic comorbidities spotlights concurrent cardiac and renal disease, concurrent infection in patients requiring immunosuppression, and concurrent diabetes mellitus and corticosteroid-dependent disease. Expert explanations on topics such as evidence-based medicine, distinguishing behavioral disorders from medical neurologic disorders, blood transfusion techniques, hyperadrenocorticism (Cushing’s disease), chronic kidney disease, respiratory and inhalant therapy, and many more.Your purchase entitles you to access the web site until the next edition is published, or until the current edition is no longer offered for sale by Elsevier, whichever occurs first. If the next edition is published less than one year after your purchase, you will be entitled to online access for one year from your date of purchase. Elsevier reserves the right to offer a suitable replacement product (such as a downloadable or CD-ROM-based electronic version) should access to the web site be discontinued.